The impact of a farm injury can be devastating — both emotionally and economically – to producers and their families. Yet most injuries are predictable, and thus preventable, if producers, farm managers, and farm workers know what to look for and how to control the hazards on their farms. That’s why the Canadian Agricultural Safety Association (CASA) and CFA team up every year to celebrate Canadian Agricultural Safety Week in March. It’s a time to reflect on the importance of farm safety, and empower producers and their families with the information and resources they need to make their farms safer. Each year, CASA and its partners develop a series of helpful resources for farmers and other working in agriculture. “Be an AgSafe Family” is the theme of a three-year program to raise awareness for importance of farm safety. Organizers aim to empower farm families with the information they need to help keep family members safe on the farm while preserving the farming lifestyle. The program is focuses on people of all ages. From the young toddler; to the busy adult juggling family, farm, and work; to the elder farmer with an age-defying drive to keep on farming. There are risks specific to each group—and ways to avoid those risks. In 2016, we focused on Keeping Kids Safe and in 2017 we highlighted safety for adults. For the 2018 campaign, we focus on seniors. 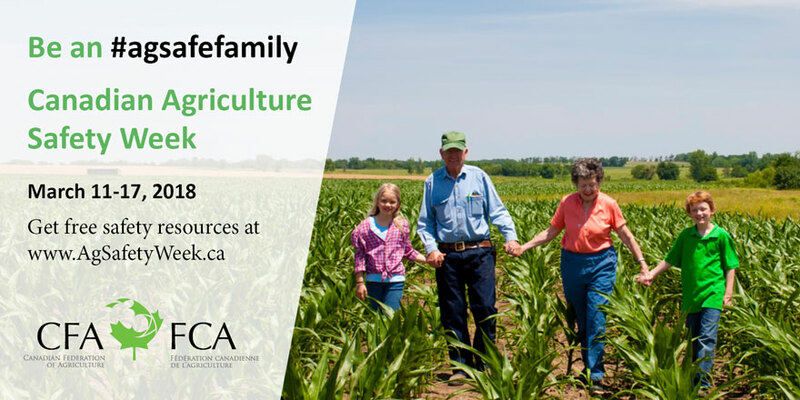 Browse through our resources, tweet your support, and declare to your friends and followers that you are an #AgSafeFamily! Visit the Agsafety Week website for news and resources!